To begin – I like to soak my Basil in ice water with a capful of Apple Cider Vinegar for, about, 20 minutes. Afterwards, I rinse the wash off and squeeze out any excess water with a cloth napkin. It gets all the pesky garden critters off the leaves before preparing it. Combine all ingredients in mixer. 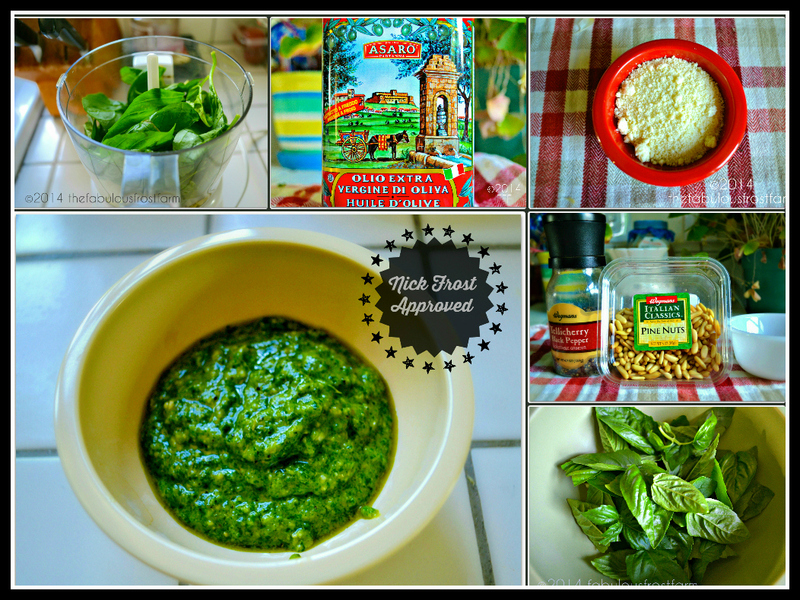 While mixing – tend to gauge the consistency of the pesto and see whether or not I need to add more olive oil. When completely blended together and creamy – transfer from mixer to sealed container. Store in refrigerator. I find that it usually makes enough for just about a pound of pasta. Disclaimer: I am an eyeball cooker …. (ohhh sounds gross!). I very rarely follow recipes and often just gauge things as I make them by tasting them. However – when I blog recipes – I try my very best to write down all measurements and ingredients that I use to make the meal as delicious as possible!